After another day of development and also reviewing the embryos on time lapse, we ended up with three high quality day two embryos. After much debate about whether we should freeze and transfer due to some soreness and cramping today as well as our limited numbers, we went ahead and transferred all three. We are ready to be pregnant and the doctor felt there were equal advantages and disadvantages to either approach. There is a fourth embryo that is still being watched that was lower quality but started to show signs of a rally today. We will be growing it out to blast using time lapse and freezing it if it continues to make a comeback. So we may have no frosties, which I’m actually okay with. I far prefer to see the bad embryos weeded out now versus waiting through two or three frozen transfers to see what happens. I’m amazed that I’m not more upset about 16 eggs being whittled down to only 3 or maybe 4 embryos. I think it’s because I know if our 1.89 genetically normal embryos are in this batch, they are very likely back home with me right now. Shockingly, I would even go as far as to say I feel good about it. All three embryos are four cell and good quality as of today. All of the key developmental stages looked good on time lapse. 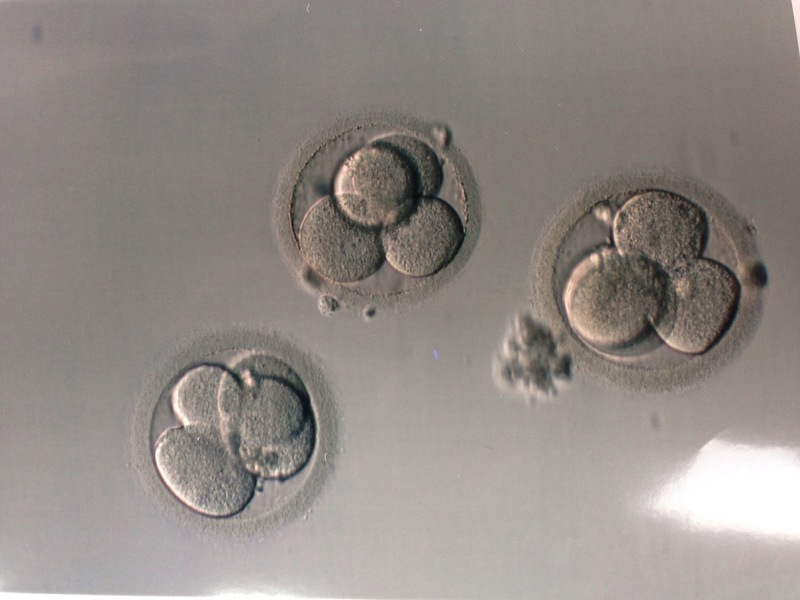 In fact, these embryos look a lot like the batch of three embryos that gave us Spork. I’ll take that as a very good sign. While I know this to be totally true, I still don’t love hearing it. A positive is a positive though, and hopefully we will get the chance to take it from there and see how it plays out. My acupuncturist was more positive than the doctor was realistically able to be for us. She is a lovely local woman who has given me acupuncture only one time. That one time happened to be the cycle that gave us Spork three years ago. Of all the Grand Rapids practitioners we have worked with, I like her style and bedside manner best and I’ve longed to work with her on transfers since then. However until now the stars have not aligned for us to work together again. You can imagine then how excited I was when at the last minute it worked out this time. She was super supportive and had a very good feeling about the process. She even said she was definitely feeling a girl vibe. Boy or girl… I just hope we have a healthy baby among those last three of sixteen. I’m off to rest and listen to stand up comedy on our three hour drive home. I want to surround these embryos with laughter, light, and love from the very beginning. Thanks for the prayers and well wishes. Keep them coming… We have 12 days to go until we reach our next milestone… The pregnancy test. I love all of the overlap between this cycle and the Spork cycle. I’m hoping these are signs from your baby-in-waiting to let you three know you will soon be four (or more, though I know that’s statistically unlikely). Keeping the prayers flowing. I am sending all of my positive vibes your way! I am wishing you so much luck! The similarities to Spork’s cycle are awesome too! Sounds like a plan! Positive thoughts and prayers!! I have a good feeling about this. It’s time. I am generally pretty good at being right! I know, right? I am in love with them already. Yay for being PUPO! I’ll be sending lots of baby dust your way in the next 12 days. Eleven. Lol. Not that I’m counting. I’m very excited for you!!!! I really want this to work for you! Thanks! I waiver back and forth between certainty that this has to be it and certainty that the poor results overall means it was a bad cycle and its doomed. Ha ha. Typical IVF. But honestly, I am doing really well. I think I am ready for whatever happens.